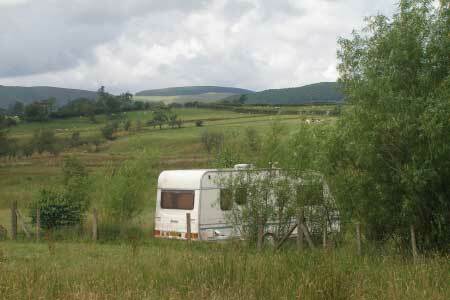 ﻿ Traditional western style camping in The Mid Wales Tipi, close to Rhayader and Llanidloes. 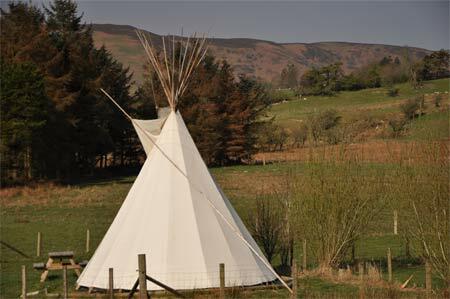 The Mid Wales tipi gives a completely new meaning to the word 'camping'. It is constructed with a number of poles crossed and tied at the top, with a canvas covering. A fire can be lit in the chiminea in the middle for warmth, the smoke passing through an opening at the top of the tent. 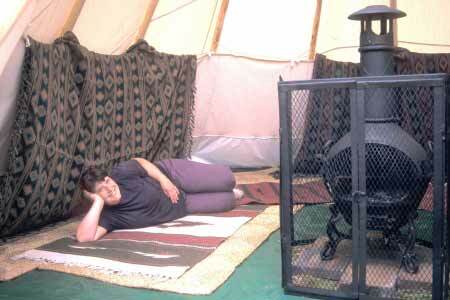 Flaps on the outside of the tipi direct the smoke depending on the prevailing wind. 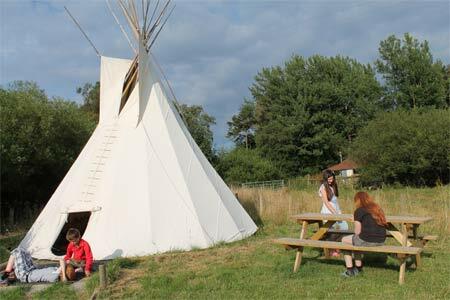 Our tipi is secluded and quiet, adjacent to the camping site with outstanding views over the River Marteg to the wild WElsh hills beyond. For a holiday stay it will provide a unique but basic style of accommodation along with the opportunity to get away from it all in the most beautiful of surroundings. It will sleep up to six people, equipped with rugs, throws and cushions to make it homely and 6 camp beds, along with a double burner gas stove and basic camp kitchen. A barbecue is also available. Alternatively we may be able to cater for you by prior arrangement or food may be available in the nearby pub (please check beforehand). Please note that you will need to bring your own sleeping bags or bedding.